January 21, 2019 by Laurie 6 Comments This post may contain affiliate links, which means if you click on a link and purchase something, I may earn a small commission (at no additional cost to you.) See my disclosure policy HERE. Jamie here! 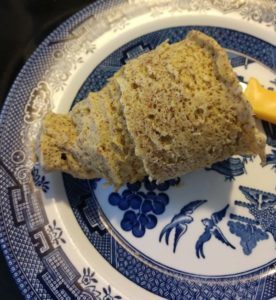 I mentioned how I started doing Keto recently – and I promised to share the coffee mug bread recipe I use and love. Well here it is!! 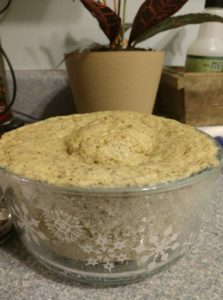 I started off with this Magic Mug Low Carb Bread recipe here which is great and uses no dairy (for anyone who needs to avoid that!) 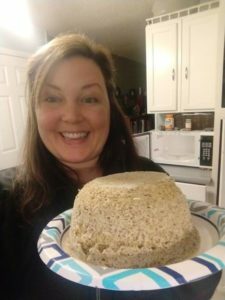 If you're allergic to nuts or prefer the less-expensive coconut flour, I also highly recommend Kasey Trenum's 90-second bread that actually tastes good! I took notes from both of these recipes and made a couple minor adjustments for personal taste. I've been making a batch on Sunday nights (a double batch if I'm sharing with my friend who just started Keto with me) and it's really helping me get through my first couple weeks. 2 . 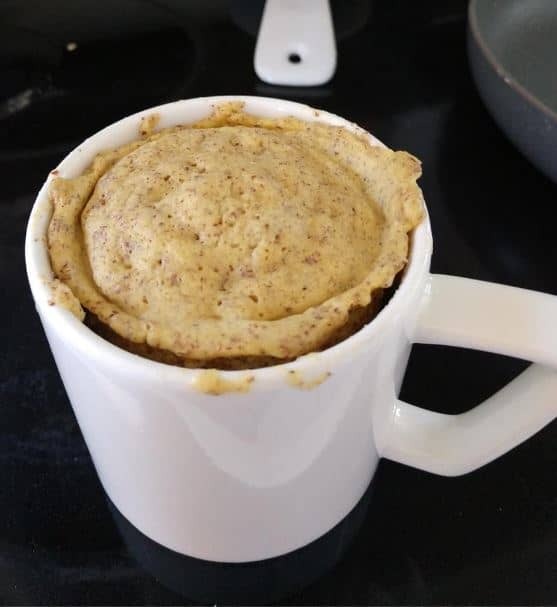 Put a generous pat of butter in the mug and melt in the microwave. Swirl it around until it coats the ENTIRE inside of the cup well. 5 . Microwave for 3 minutes, the bread should rise to the top (or even slightly out of) the mug. 7 . Slice into thin circles. 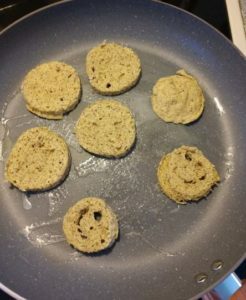 Try to get 4-6 thin bread circles out of your “loaf”. The amount of butter you see above was my first attempt and was NOT ENOUGH! 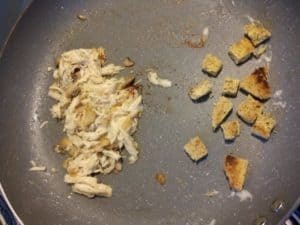 SUPER IMPORTANT: My friend Kasey warned me and she was SO RIGHT that you really need to put a GOODLY amount of butter in a skillet and toast up your bread circles on both sides. This makes them YUMMIER and STURDIER for any sandwiches or mini pizza plans you might have in mind for the week. 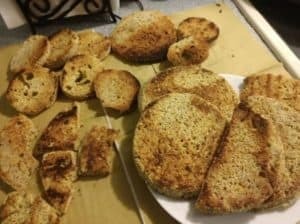 Keep in mind this is almond flour, and it burns easily. Keep a good eye on those puppies! 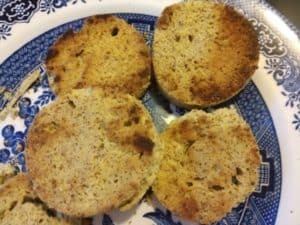 My pictures are super horrible (because I only took them to send my mom) but here are some ways you can use your almond flour coffee mug bread throughout the week. 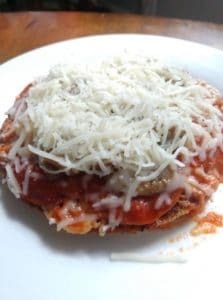 Load cold bread up with low-carb marinara, meats you like, mushrooms, veggies, etc… and lots of cheese. Put it in the microwave and voila! I love that when you microwave this bread it actually gets a little crisper. Like it activates that butter and re-toasts it. Perfect! 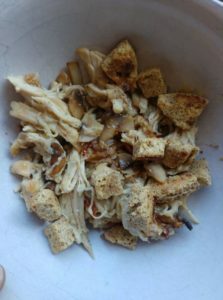 You can use these for buns when you make Mississippi Chicken – but when I use the leftovers for a few days, I like to put my chicken in a bowl (I've added sauteed mushrooms here) and add some cut up bread as an extra crouton-like texture. Macros: Depending on if you use cheese and which flour you choose – your carbs will be slightly different. Plugging these ingredients into an app like MyFitnessPal or CarbManager will give you your totals! 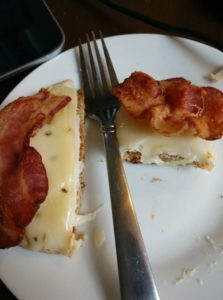 For tons more ideas on ways to eat well on Keto – check out these FREE Keto Meal Plans here! Oh my gosh… I’m so excited about this! You are totally right, frying them in butter after making them takes it from a sad, pointless thing into glory!! YUM!! How many servings for the single mug bread or the double batch in the bowl? I slice mine as thin as I can so I can use them more often with less carbs 😉 But you can probably get 4 -5 slices out of the cup and maybe more for the bowl.